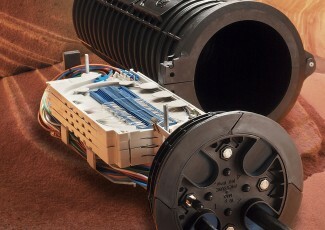 Not only can the COYOTE® Dome accommodate ADSS cable, but can also accommodate various types of OPGW cable. OPGW with stranded stainless steel (ridged) buffer tubes. OPGW with a slotted core and flexible plastic buffer tubes. OPGW with a central aluminum tube and flexible plastic buffer tubes. OPGW with a central aluminum tube and central stainless steel or hard plastic (ridged) buffer tubes. OPGW with a central aluminum tube but without central stainless steel or hard plastic (ridged) buffer tubes. Available sizes: 6.5" x 17" and 6.5" x 22"
Transition Furcation Kits for OPGW with stainless steel (ridged) buffer tubes (see table above). Additional grommets may be ordered for OPGW applications. One Standard Splice Tray is included I the COYOTE Dome Kit. Additional splice trays may be ordered.